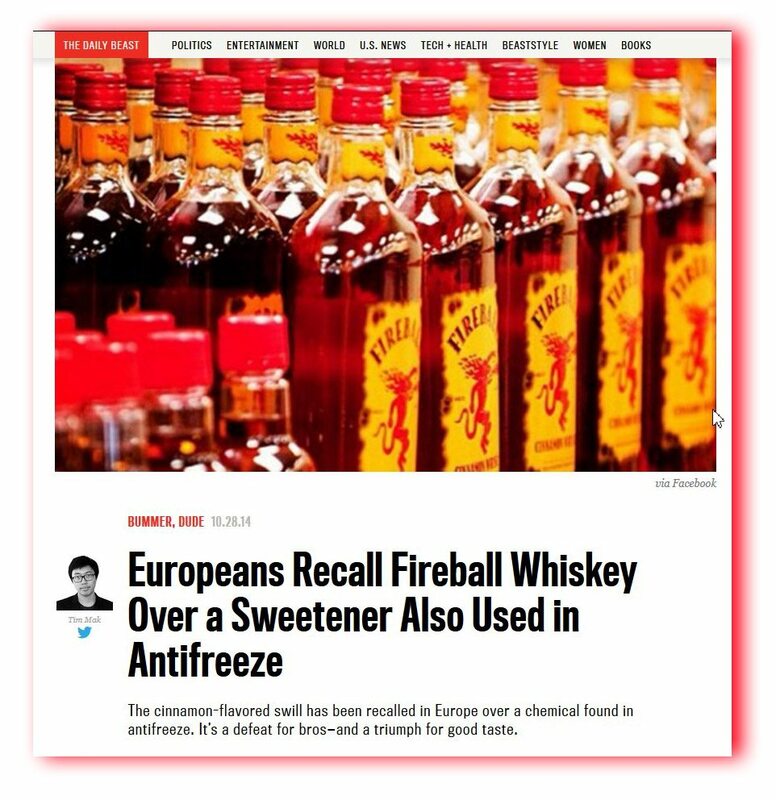 The Daily Beast published a highly relevant story a few days ago, slamming Fireball and propylene glycol. Fireball is a hugely popular “Cinnamon Whisky,” and a recent label approval is here. 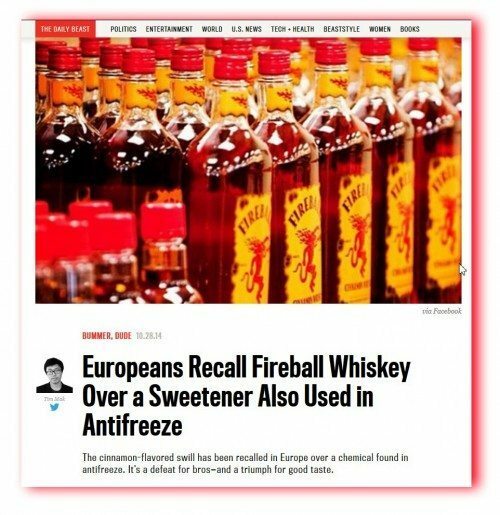 The story explains that Fireball contains propylene glycol, commonly known as PG, and in the most alarming way that could probably be set forth without a big lawsuit, the article heaps scorn upon PG and Fireball. As of today, Google has more than 81,000 stories about fireball propylene glycol, but the Beast story was one of the first. When I talked it over with Kate, she said “Robert, don’t be silly. Everything has established toxicity levels, even things like water and vitamins. Yet, we are encouraged to drink lots of water and supplement our diets with multivitamins. PG is fine.” I happened to be down the street from Sazerac’s plant yesterday, at Kate’s office, whereupon she offered me a shot of propylene glycol, straight up. With assurances from her colleagues (and FDA) that it’s safe for human consumption, I sipped the PG. It seemed oily and bitter, and wholly without any smell. The bitter aftertaste lingered for a few minutes and later I tasted a small amount of sweetness. I am pleased to report that I woke up just fine this morning without any apparent effects. For the record I note that the city and her plant are full to brimming over with some of the finest beverages in the world, but Kate only offered me the PG and a bottle of water. We thought it was important to respond to Tim’s article because it seems clear that it is aimed at low-information consumers such as your typical frat boy. The article is replete with references to “Bummer, Dude” and Total Frat Moves, not exactly paragons of nuance or subtlety (and yes, the Food Babe also has it wrong). We think they are likely to take away precisely the wrong message — for example the entirely incorrect idea that PG is worse than too much alcohol, or too much sugar, or too much junk food. Or, the entirely wrong idea that Fireball is somehow worse than any of the next 10 cinnamon whiskeys, which probably contain PG as well. The Beast story also tends to suggest that US regulators such as FDA and TTB are asleep at the switch here, and once again this is highly misleading or wrong. Propylene glycol … is considerably less toxic than ethylene glycol and may be labeled as “non-toxic antifreeze”. It is used as antifreeze where ethylene glycol would be inappropriate, such as in food-processing systems or in water pipes in homes where incidental ingestion may be possible. 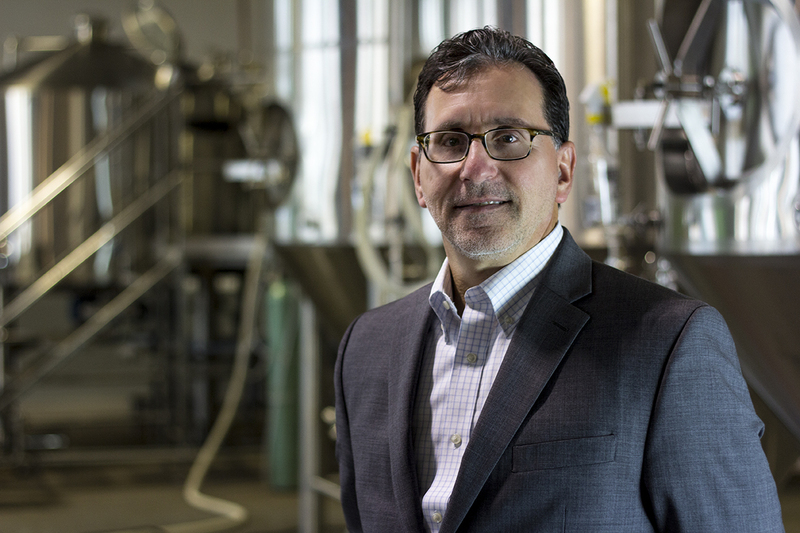 As confirmation of its relative non-toxicity, the FDA allows propylene glycol to be added to a large number of processed foods, including ice cream, frozen custard, salad dressings and baked goods. Fireball does not contain any antifreeze at all and the suggestion is ridiculous. Sadly, this is the media’s way of crafting attention grabbing headlines, but it simply is not true. We would not dream of putting antifreeze in our product. … PG is a clear, colorless liquid with the consistency of syrup. It is practically odorless and tasteless. It is the ideal stabilizer and clarifier for a large variety of flavors that give most of today’s food and beverages their distinctive taste. … Flavor companies use it to carry flavor ingredients through to the final product, to preserve the integrity of the flavor and to ensure it is shelf stable. We understand that very few flavors can be made without it. Food scientists tell me it would take many ounces of PG at a sitting to induce a harmful effect in an average person. A bottle of Fireball has less than an eyedropper full of PG. Please don’t take any of this as medical advice. But, now that the Ice Bucket Challenge is passe, I want to publicly call out Tim for the PG challenge. He should put up some examples of ill effects from PG, or drink a shot of PG forthwith. * Stop the press. LabelVision did find one lonely label unabashedly declaring the presence of PG, and it’s here. Filed Under: alcohol beverages generally Tagged With: fda, media buzz, policy, would you drink it? learned the difference between the two glycols. Thanks, Robert Contreras. dairy unlikely combinations statement of composition current events legally interesting/controversial hybrid music-booze-society functional rejections history media buzz sexual trademarks-beverage writing/witty/funny type craft international serving facts/allergens sin speech political formulas design brand extensions drinkwire would you drink it? litigation container origin policy narrowed demographic therapeutic ingredients procedure APTs famous risqué speaks for itself caffeine/secondary effects business strategy organic/vegan/green non-liquid processing fda would you approve it?